Hello Day July 14th I made a sketch of m6 and I liked it very much. 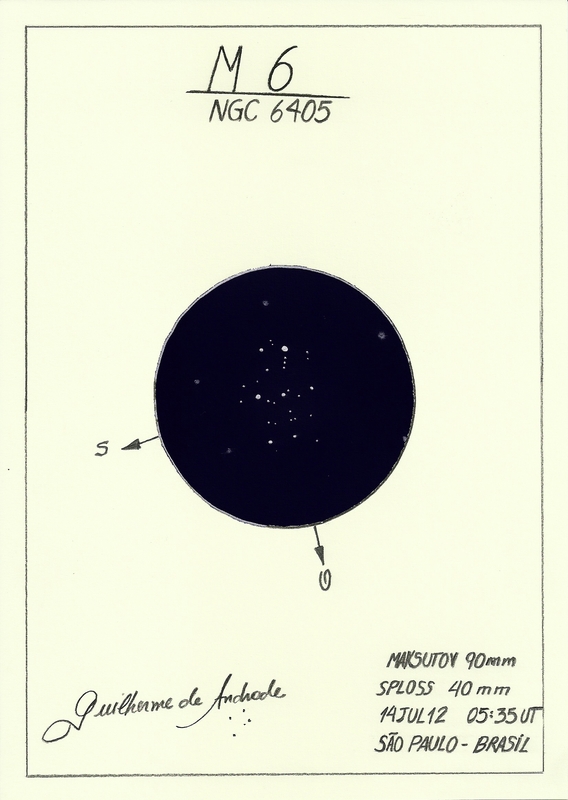 This sketch was done by looking through a telescope M6 90mm Skywatcher Maksutov. I used a 40mm eyepiece superploss, totaling 31.25 x magnification and a diagonal of 1.25 inches dieletric WO. The paper used was canson 200g/m2 in the cream and the eye region was reversed using the GIMP software. I used pencils from HB to 8B Steadtler Lumograph Mars. Clear, 9 ° C, wind o.3km / h harmed by seeing a fine mist that was intensifying. M6, in dark places, it is easily seen with the naked eye like a smudge in the sky, next to M7. With a 10×50 binoculars, both m6 and m7 are visible. Isso aí, representando o Brasil! Parabéns pelo desenho, logo publicam um meu de Omega Nebula. That’s it, another Brazilian sketch! Congratulations on it, I hope they show my Omega Nebula soon. Obrigado, Rodrigo. vamos nos encontrar para fazer uns desenhos.